On Sunday, March 24, 2019, Esther Penner, age 93, went to meet her Maker at the Herbert & District Integrated Healthcare Facility, Herbert, SK. Esther lived her life for the Lord! Esther was born on September 12, 1925 in Herbert — the third of six children born to Cornelius & Susie Gerbrandt. She met the love of her life, John Penner, and they were married on October 30, 1944 and were blessed with three children — Joyce, Tim, and Donna. 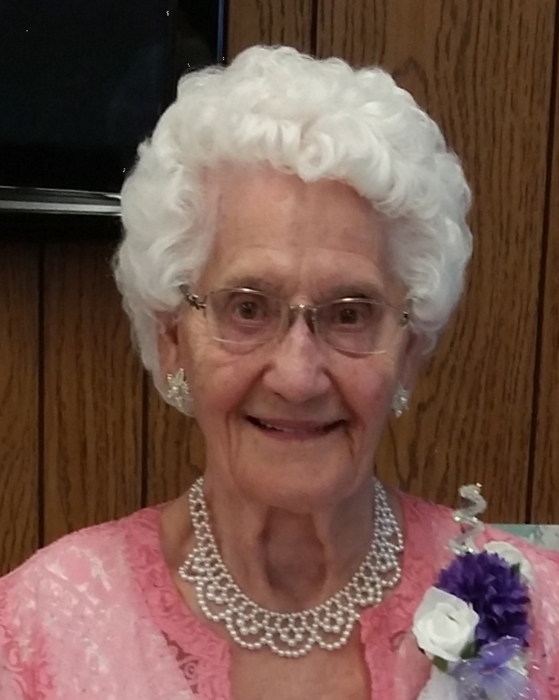 Esther enjoyed painting, flower arranging, cake decorating, and coin and rock collecting. Later in life, she moved to the Herbert Manor (Prairie Wind Estates) where she enjoyed the great companionship and received wonderful care. Esther enjoyed every minute spent with her family, especially her grandchildren and great-grandchildren. Esther is survived by her children, Joyce (Jack) Loudon, Tim (Brenda) Penner, and Donna (Greg) Nelson; her grandchildren, Shane Loudon, Brett Loudon, Chris Penner, Jenifer (Trevor) Lawrance, Shawn (Wendy) Nelson, and Colin (Kayla) Nelson; her great-grandchildren, Sienna Miller, Emma Miller, Everett Nelson, Aiden Nelson, Jayden Nelson, and Avaleen Nelson; her brother, Harry (Lena) Gerbrandt; her sisters-in-law, Elizabeth Gerbrandt, Mary Penner, and Mrs. Mary Penner; and by numerous nieces and nephews. Esther was predeceased by her husband of 65 years, John Penner; her parents, Cornelius & Susie Gerbrandt; her siblings, Jessie Peters, Katie Mathies, Irvin Gerbrandt, and Elmer Gerbrandt; her sisters-in-law, Kathy Gerbrandt and Anne Andres; and by her brothers-in-law, Leonard Peters, Dave Mathies, Henry Penner, and Jake Andres. The Funeral Service for was held on Friday, March 29, 2019 at 2:00 pm from the Church of the Open Bible, Swift Current, SK with Pastor Rob Cochrane officiating. “Leaning on the Everlasting Arms” and “The Old Rugged Cross” were sung by the congregation, with Barb Klassen serving as pianist. Scripture was read by Shawn Nelson. A poem written by Esther was read by Colin Nelson. Special music was brought by Jenifer Lawrance, who sang “The River,” Don Mathies, and Mark Penner. The tribute was given by Joyce Loudon. The obituary was read by Shane Loudoun. The Private Interment Service was held Saturday, March 30, 2019 from Hillcrest Cemetery, Swift Current, SK with Esther’s grandchildren, Jenifer Lawrance, Shawn Nelson, Colin Nelson, Shane Loudon, Brett Loudon, and Chris Penner serving as Pallbearers. The Honorary Pallbearers were Esther’s great-grandchildren, Sienna Miller, Emma Miller, Everett Nelson, Aiden Nelson, Jayden Nelson, and Avaleen Nelson. In memory of Esther Penner, donations made to Gideons International would be appreciated by the family.